With this heatwave going through the city, we wanted to share the recipe of one of our summer favorites: elote asado or Mexican style grilled corn. You could use store bought mayonnaise for this recipe, but I find that the homemade version tastes better and is really quick to make. However, when using raw eggs, it’s important to buy high quality eggs that you trust have been handled well. You can get organic, pasture raised eggs from Great Valley Poultry at Mission Community Market every Thursday. Similarly, you can use store bought chili powder to complete this dish, but upon running out said condiment one day, I realized that I can just use a homemade barbecue spice blend I had prepared for another recipe, and it turned out amazing. Of course, I’ll be sharing the ingredients below to that as well. Take advantage of fresh corn from Happy Boy Farms before the season is over! You can use your food processor or your kitchen mixer (or even your bare hands if you want to break a sweat). Add egg, mustard, lemon juice, and salt to the bowl of a food processor and process for 30 seconds. Now the trick is to add the oil in tiny amounts – a few drops at a time, until you can see the mayo starting to thicken. This usually starts once I slowly added about a ¼ cup of the oil. After that, you can add the oil to the mixture a bit faster, maintaining a very thin stream as you pour it in. Taste it and adjust salt and lemon if needed. I usually add a bit of sugar to it, but it’s completely optional. You can store it in an airtight container in your refrigerator for up to two weeks. Mix all ingredients until they are equally distributed and store in a spice jar. Clean corn and place into a large pot with enough water to cover. Once the water starts boiling, turn the heat down to medium and cook for 10 minutes. When done cooking, stick them in the oven (in lieu of a grill) and broil them for about 5 minutes, turning them every now and again to develop an even brown color. Now it’s finally time to assemble your dish! 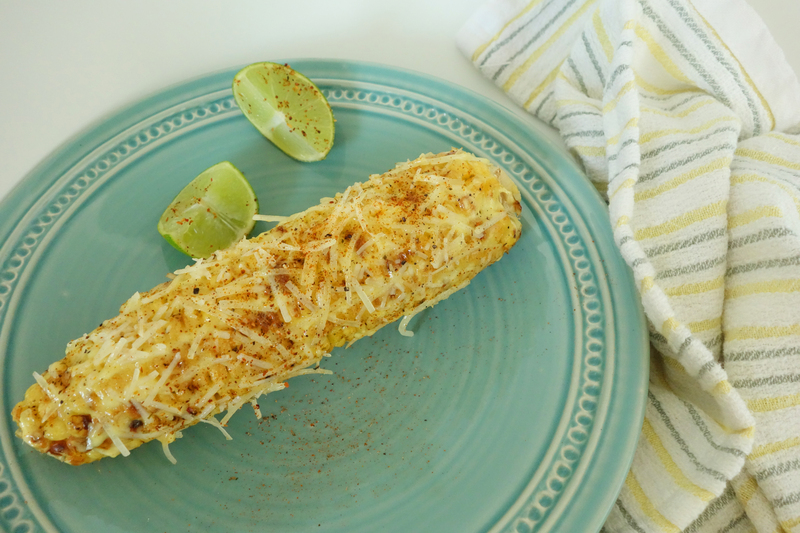 Rub each corn with half of a lime. Spread as much mayo on them as your heart desires. Sprinkle with chili blend to taste.